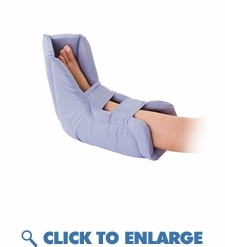 This heel raiser cushion is designed to protect the heel from pressure sores. One size fits all. The top folds down to accommodate smaller feet or compromised toes. The anatomical strapping pattern reduces migration and foot drop. This total heel suspension cushion fits the left or right foot and includes a laundry bag for washing. Ideal for patients with diabetes, peripheral vascular disease, neuropathy, and others at risk for impaired skin integrity. Can be used with other support surface products such as gel mattresses, medical mattresses, and alternating pressure products. This heel raiser cushion is designed to protect the heel from pressure sores. One size fits all. The top folds down to accommodate smaller feet or compromised toes. The anatomical strapping pattern reduces migration and foot drop. This total heel suspension cushion fits the left or right foot and includes a laundry bag for washing. Ideal for patients with diabetes, peripheral vascular disease, neuropathy, and others at risk for impaired skin integrity. Can be used with other support surface products such as gel mattresses, medical mattresses, and alternating pressure products.